Not sure how this depicts the Juggler or Magician? Click here. Etteilla: Illness, Infirmity, Sadness, Anguish, Mental Illness, Anxiety, Physician, Magician. 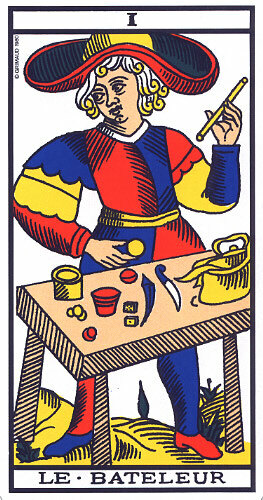 Lévi: The Jugglers body and arms form the letter Aleph, round his head there is a nimbus in the form of the lemniscate, the emblem of life and the universal spirit; in front of him are swords, cups, and pantacles, and he uplifts the miraculous rod towards heaven. Illustration (left): The Juggler from Ancien Tarot de Marseille by Paul Marteau (1930) (copyright &COPY; 1980 Grimaud). Click the image for a larger one. Christian: This Arcanum is represented by the Magus, the type of perfect man, in full possession of his physical and moral faculties. The Magus holds in his right hand a golden sceptre, image of command, raised towards the heavens in a gesture of aspiration towards knowledge, wisdom and power; the index finger of the left hand points to the ground, signifying that the mission of the perfect man is to reign over the material world. Papus: The top of the figure is occupied by the divine sign of Universal Life, the lemniscate, placed upon the head of the Juggler. The bottom of the figure represents Earth ornamented with its productions, the symbol of Nature. Lastly, the centre is occupied by the Man himself. God, Man, and the Universe are, then, the three meanings of this card. Felkin: The Magician represents the union and balance of the elemental powers controlled by mind. The Adept is depicted dedicating the minor implements on the Altar. It is a card linked with the name Tahuti (Thoth) and Hermes. Waite: In the Magicians right hand is a wand raised towards heaven, while the left hand is pointing to the earth. This dual sign shows the descent of grace, virtue and light, drawn from things above and derived to things below. This card signifies the divine motive in man, reflecting God, the will in the liberation of its union with that which is above. Wirth: The first cause is a Magician and is reflected in everything that is active. In the Universe he is God, seen as the great suggestive power of all that is accomplished in the Cosmos; in man he is the seat of individual initiative, the centre of perception, of conscience and of will power. He is the Ego called to make our personality, for the individual has the mission to create himself. Illustration (left): The Juggler from The Knapp-Hall Tarot (1929) designed by Manly P. Hall and drawn by J. A. Knapp (copyright &COPY; 1985 The Philosophical Research Society). Click the image for a larger one. 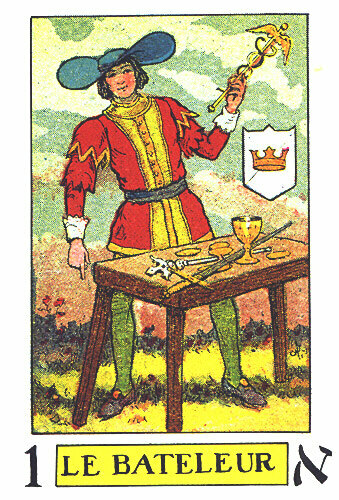 Case: Though the Magician knows himself to be above nature, he understands that his operations succeed to the degree that his thought, word and action transmit faithfully the powers of the plane above him. Crowley: This card represents the Wisdom, the Will, the Word, the Logos by whom the worlds were created. In brief, he is the Son, the manifestation in act of the idea of the Father. Gray: Transformation, change. Sometimes destruction followed or preceded by transformation. The change may be in the form of consciousness. Sometimes it may mean birth and renewal. Sadhu: For those who are acquainted with Eastern conceptions, related to the idea of this Arcanum, I can state, that the Vedantic idea of the Atman is very close to the Man (Adam-Kamdon) symbolized on this card. ONeill: Though barely above the level of misery, the Magician represents the basic dignity and divine mission of man. Since he possesses both body and soul, he stands between the spiritual and material worlds. He carries with him the magic wand, the Caduceus, the Staff of Moses. Pollack: The Magician represents consciousness, action and creation. He symbolizes the idea of manifestation, that is, making something real out of the possibilities of life. Turk [who replaced the Magician with the Magian]: The epithet magician has moved far from the enlightened soul who led mankind in early times and has come to mean one who conjures and juggles with material objects in order to impress a gullible audience. The Magian, on the other hand, is the Magus who uses hidden energy to bring illumination to the world. Symbol (above): It is best viewed sideways and depicts Hermes staff, the Caduceus, which is sometimes held by the figure of this Arcanum.